This is an interesting question and addresses a common misconception. 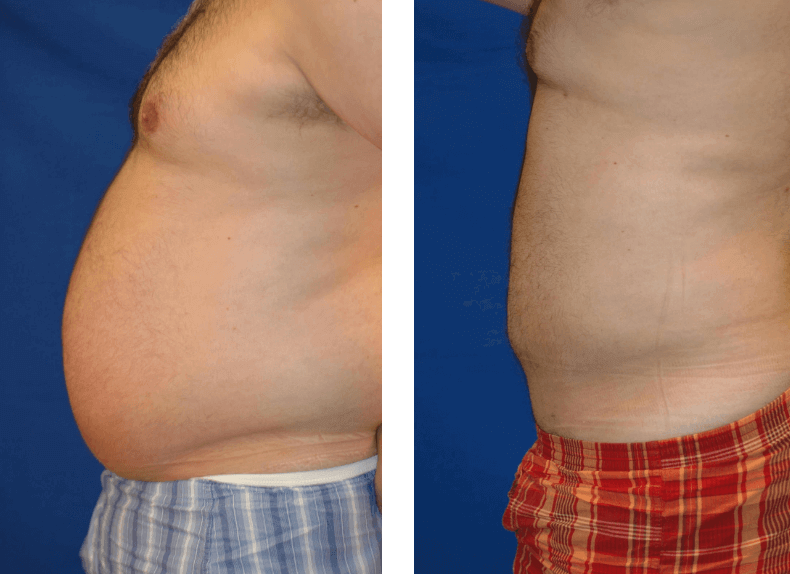 Liposuction is currently the most commonly performed aesthetic surgical procedure in the United States. The concept is relatively simple, analogous to a vacuum cleaner, that selectively removes excess fat between the skin and the first layer of muscles. Liposuction cannot remove deeper fat, for example the fat which surrounds your intestines (this deep fat can only be removed by decreasing caloric intake or increasing caloric burn through exercise). The excess outer fat between the skin and muscles, can be reduced by running a metal tube through the fatty layer, creating empty tunnels, which collapse as the patient heals and gives a patient the desired contour improvement. During the liposuction process, the excess fat is physically removed, collected in large bottles (up to five liters can be safely removed in one sitting), and disposed of as biological waste. This removed fat, therefore, cannot go to other parts of your body! Even the thinnest super model has a thin layer of fat under the skin and when surgeons perform liposuction, at least a half inch layer of fat is always left between the skin and the muscles, except when suctioning a neck. The removal of the fat does not prevent someone from gaining weight in the future! The equation is pretty basic – your weight is the result of what you consume minus what you burn off! If you eat roughly what you burn, before or after surgery, your weight will be stable and your fatty layer will remain at the same thickness. If you burn more than you consume, your fatty layers will decrease in thickness. Unfortunately, the converse is also true – if you consume more than you burn, whether or not you have had liposuction, your fatty layers will increase in thickness. This increase in thickness will occur over the part that was liposuctioned as well as over other parts that were never suctioned. We all know some overweight people with massive thighs or arms, large bellies, and very full necks, whether they have had prior liposuction or not. Liposuction is designed to treat stubborn areas that do not respond well to diet and exercise – liposuction is not a weight loss technique and does not prevent someone from gaining weight in the future! 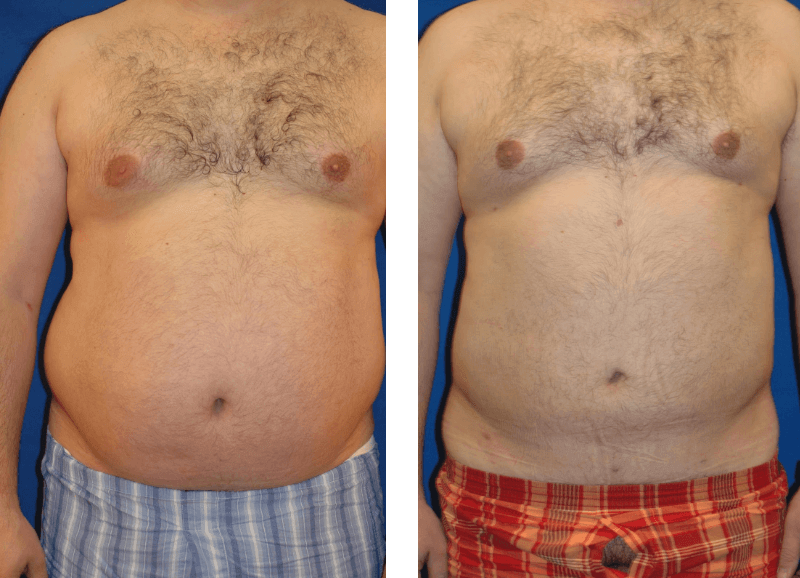 A good way for me to discuss this further is through photographs and I would like you to look at the accompanying pictures of a 35 year old male who chose to have his abdomen and love handles contoured, all in a procedure that took less than an hour! Sometimes a very pleasing transformation can be achieved with a relatively simple and minimally invasive procedure! If you have any areas of concern or would like to evaluate your options, please feel free to contact Orange County Plastic Surgery at 949-888-9700.